For a low budget Christian film, Samson wasn’t all bad. It sticks to the Biblical story by weaving the highlights of his narrative through some creative license. For example, Samson’s father and brother play main roles in pushing him towards being the judge. They also expand upon the Philistine noble family and give the prince the role of the main villain, though he played the part like a whiny kid. He never really proved himself fearsome or much of a challenge to Samson. True to the Scripture, Samson weakness to foreign women was his downfall (which was kept PG with just a few kiss scenes, rather than him visiting prostitutes. See Judges 16:1)… But the film also adds his reluctance and spiritual struggle. Delilah was kind of an annoying character to me. In this film version, she has an abusive husband in the prince who forces her to play the part of a lover to Samson to steal his secrets. Unlike the Biblical account, she isn’t really devious. She actually develops mutual feels for him and becomes very remorseful for her eventual betrayal. This makes her death create unease in the viewer. Like why? It didn’t seem to do her justice at all by removing any chance of redemption. After all, she was just a tool of the prince. From a plot perspective, she didn’t deserve to die, her only crime being an association with Samson. I felt if they made her actually evil and manipulative (with Samson playing into it because of his overconfidence) that would have made the story much more suspenseful and dramatic. It could have made for a big reveal where she showed her true self as always being loyal to the prince. Instead, she plays a weak and whiny character with little depth, much like her husband. They did include all the fascinating nuggets from Samson record, including killing the lion, giving the riddle the Philistines, burning their crops by lighting the tails of foxes, destroying the gate, and killing over 300 with the donkey bone. Sound like a lot for an hour and a half film? It certainly felt that way and made for a rushed and jumbled story. The film made most of these instances revolve around a love drama, while the Bible implies it was his pride. Again, sticking closer to the source material probably would have helped the story seem more natural. The Samson I knew from the Bible became a killing barbarian because he felt unbeatable in his own power. A story centered around a mindless warrior would have helped us understand how he could be deceived by Delilah so easily. His brash overconfidence in his physical strength makes the moral of the story. His heart and wondering, lustful eyes were the enemy his muscles couldn’t save him from. The movie, however, takes a different approach. It seems to position him as a reluctant leader who more wants to carve his own destiny after feeling God abandon him. Like all the film’s main characters, Samson’s flaw is presented as his desire to be independent of all his circumstances. The prince guy (forget his name) didn’t want to be babied by his father. Delilah wanted “true love” apart from royal politics. 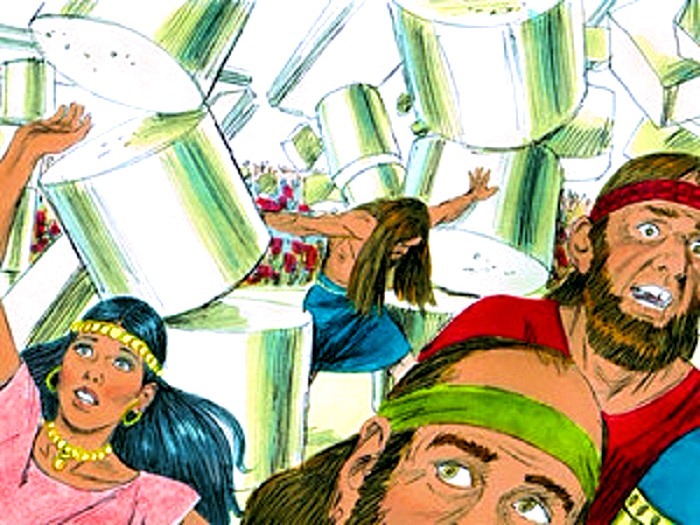 And… the movie Samson seemed to just want peace with the Philistines at any costs and freedom to do whatever. So if you go into the film expecting a bold warrior going on a Rambo style pagan killing spree and getting seduced by the conniving Delilah… you’re going to be disappointed to find a wish-washy forced hero and Philistine women who aren’t really evil. I understand that this story is played down to keep it relatively family friendly, but the Biblical Samson wasn’t a wimp and the plot could have been much more intensive, instead of drama driven. Oh and another thing is God seems to be strangely absent from the film. There’s some ruffling of leaves in the wind and thunder clouds when Samson prays for strength… and that’s about it in the whole story. There’s some mention of some vague prophecy surrounding Samson’s destiny to free Israel. On the other hand, the Bible has the “Angel of the Lord”, possibly pre-incarnate Christ, visit his parents beforehand and explain everything about their coming son directly. See Judges 13. The clearest direct involvement of divine agency comes through Samson’s brother retelling a memory of God talking to him. With God having a more shadowy presence in the film, there’s actually not much supernatural about the movie. Though ironically for a blatantly Christian film, God’s absence might actually make it palpable to a wider audience. Overall, I think the film might have been better if it stuck even truer to the character of Samson pride and lust, even if that meant losing the family value of it. I even think the movie would have done better as an animated series that could have paced it better. Much like the Prince of Egypt, a cartoon version wouldn’t suffer from the subpar acting and a lack of special effects. I’d love a fighting-styled anime version of the tale… THAT would really allow for an exaggeration of his supernatural strength. But hey… it’s not a terrible film. There’s action, drama, and hits home spiritually in many ways. I give it a solid 3/5 stars! What about it all rings true spiritually? In the film, Samson’s constantly feels like a failure and thus that he’s of no use to Israel and God. The story teaches us that God always forgives and our experiences shape us for His purpose. We certainly miss out on God’s blessing because of sin, but, once saved, God never abandons or loves us any less because of our wanderings. Samson’s power wasn’t in his physical hair; it was always in his faith. We are always useful to God when we remember our true identity as children of an everlasting Father. We don’t have to be perfect because Christ already is our perfection for us – that’s the whole point of salvation! Grace is sufficient for everything and nothing can separate us from the love of God (see John 10:28-30). The gospel is a powerful message of hope and forgiveness that the world desperately needs. With my freelance writing services, I can help communicate your own message. Hope this is all helpful if you plan on seeing Samson! I’d love to hear your thoughts on the movie!